After the marathon finish high, I was happy. Then the endorphins wore off and I was disappointed, cried, and wallowed. I went to bed and now I woke up somber. Please be ready to read this recap – it is long, and may actually feel longer than 26.2 miles. The London Marathon was supposed to be my race. My race to run my absolute best. When I ran Chicago last year and my back cramped up, yet still set a PR, I knew I had more in me and wanted redemption. 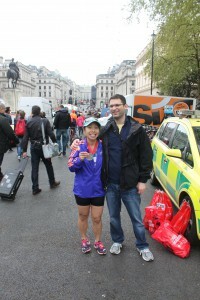 Then I ran NYC three weeks later and finally finished a marathon strong and excited to run another. 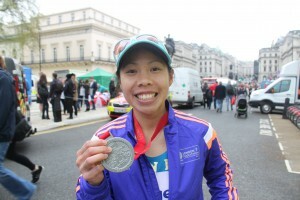 That runner’s high led me to sign up for London. I have trained for over 4 months – half on the treadmill because of the brutal Northeast winter we had, and half with some amazing running friends – Julio, James, and Amanda. I also ran a number of races that served their purpose as training runs. I came to London feeling like I could have done more with training (but I think I will always feel that way) but that I was strong. I knew that even if I had a bad day, I should have been able to PR, but my big goal is sub-4. The same goal I’ve been chasing for a little while now. I choked in London. There is no better way to put it. I ran the first half of the race yesterday in around 2 hours. While that meant that I would have needed to negative split the last half of the race to run a sub-4, it was still within reach and all I needed was 4:17 or better to PR. The second half of the race, I was on a downward spiral. Eventually my quads tightened up and my back started cramping. The discomfort was nothing like I felt in Chicago, but I just gave up. When the going got tough, I gave up. I mentally broke down and started walking. I could have run a bulk of what I walked but I chose not to. I’m not saying the run would have been fast, but at least I would have moved faster. 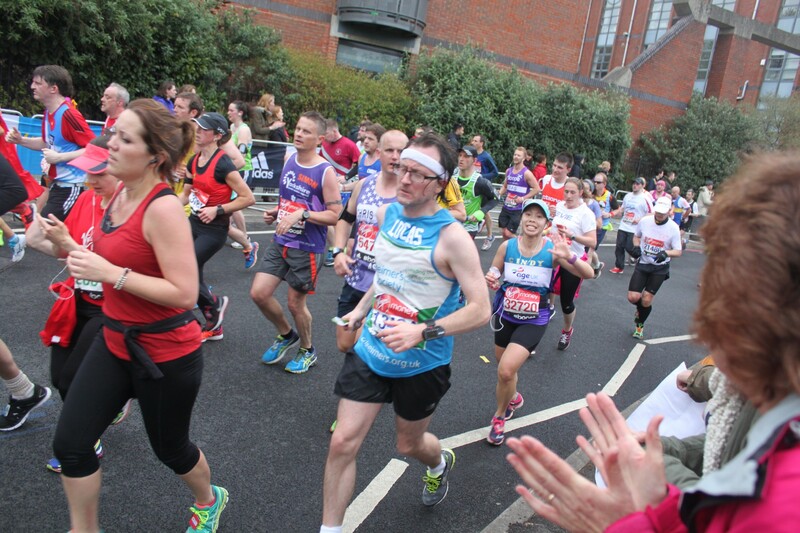 I was in the pits so much that I couldn’t get myself to enjoy the sights of such a beautiful city or appreciate the roaring of the crowds (the best I’ve been in any marathon so far). When I finished the race in 4:21, I was just happy it was all over. I was happy I finished my 7th marathon (in 2.5 years), 1st international race, and 3rd World Major. I was actually so happy that when I picked up my bag, the guy told me to stop smiling (by the way, everyone is so nice in London). You’d think I’d run this awesome time. With every experience, there is the chance to learn from your mistakes. After the wallowing last night, I have been able to narrow down the things that didn’t work for me this training cycle and may have led to my fall, and things I could work on. —Mimicking race day conditions. This was hard to do given the winter we had. I wasn’t able to run in my race clothes and I also ran most of my long runs with a Camelbak which I did not use yesterday. I was used to having water on demand and being able to fuel easily. My fuel was stored in the pocket of the Camelbak and I didn’t need to go very far to grab it. Also, on the long runs, I would stop to fuel – i.e. if I was at a traffic light. On my last 20-miler, there was over an hour break in between the first 10 and last 10 miles, so I had the chance to fuel then. When it got to the race yesterday, I was struggling with the right place to store the fuel and plus, I nearly threw up a couple of times from trying to chew and drink water. —Fueling day of the race. I’ve used a different strategy every marathon I’ve run and that just goes to show that I have yet to master the right plan. If I tried mimicking race day conditions more often during training, I may have been able to change things during training. Yesterday, I barely ate breakfast because I was nervous and anxious. I’m like that before a lot of races, but I also didn’t have time to force food down. I ate half a banana, two bites of a bagel and peanut butter, drank half a cup of coffee, and some Generation UCAN. On the race, I was choking and having a hard time swallowing the Honey Stinger Energy Chews. I should have known better than to stick with this plan because I’ve always had a hard time eating on runs. Needless to say, I was barely fueling enough during the race yesterday especially for the lack of eating I did the morning of. —Lacking mental strength. One of the first thoughts I had when I crossed the finish line yesterday was maybe I’m not mentally strong enough to run a marathon. When the going got tough, I faltered. I have the strength and drive to push my way through a training cycle but I can’t pull through during a race. I don’t know off-hand how to change that but I need to figure that out. —Back soreness. I understand my quads being shot during a run, but I’ve had more issues with my back lately. A lot of that can be attributed to the nervous energy I have during a race, thus I am too tight. However, I am always tense and my back is always the part of the body that the masseuse complains about. I need to learn how to loosen up – in life and in running (though running is a part of life). —Advanced preparations. I worked 9 days leading up to leaving for this trip (did I complain about this enough already in my earlier posts?). It was our busiest time at work and I barely thought about the preparations for the trip. I left packing to the last minute and didn’t think about the race until I got here. I’m usually pretty darn organized but this time I was not – I left all sorts of stuff at home including the instant oatmeal I wanted to eat race morning. I knew I was going to be in the busy season at work leading up to this trip, to what extent, I guess I didn’t fully know, but I am not terribly good at compartmentalizing. I let my stress from work boil into my personal life and everything started to suffer. While it is easy to beat myself up, there are some things I wouldn’t change. You probably noticed that I didn’t mention going out too fast above and that’s because given my strategy for yesterday’s race, I wouldn’t have changed my pacing in the first half one bit. I ran the first half smart and strong. For parts of the first 13 miles, I was slightly ahead of the 4:00 pacers and I felt great. The plan was always to run the first couple of miles a little slower than marathon goal pace, and then push for the middle part of the race. According to my Garmin splits, I had some sub 9-minute miles in there. Given everything I was doing in training, those times seemed attainable and that is why I am so upset with myself and would not change how I started the race. And finally, after beating myself up, here are my pros/cons of the race. —Con – tracking logistics. It seems like some of the logistics of the race was not well thought out. The tracking link wasn’t available until race morning. The app didn’t work for tracking anyone else, though it worked for Paula Radcliffe. —Con – water and Lucozade. The water and the UK version of Gatorade (Lucozade, which I think is way too sweet) were handed out in bottle form. Instead of the cups of water or Gatorade, we were handed small bottles of water and large bottles of Lucozade on the course. At first when I heard this, I thought this was great for the runners since it is easier to drink out of a squirt top bottle but it is such a waste of the drink and for the environment. Also, when you’re tossing out bottle, some spectators got hit or runners would trip. I nearly tripped three times because I accidentally stepped on the bottles. —Con – spectator experience (from Josh’s perspective). 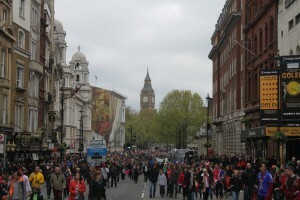 NYC knows how to handle crowds, but London does not. There were more crowds along the course than any other marathon I’ve run but there was no organization. People were flowing everywhere. There was no police or security to organize it, except for course marshals who didn’t seem to do too much in terms of holding people back. The Underground stations didn’t handle the traffic well either. —Con – narrow course. 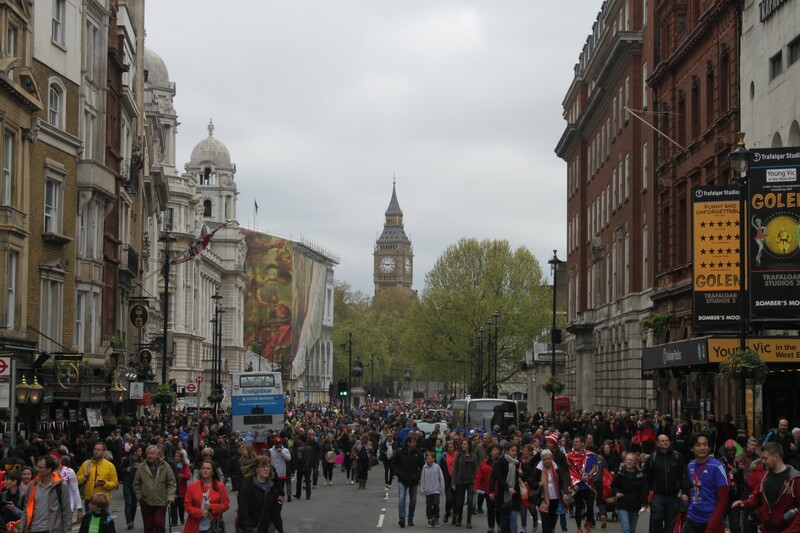 There were about 38,000 runners that started the run yesterday but the roads in London were just not wide enough to handle the runners plus the spectators. From what I understand the faster you are, the less this was an issue, so it was just me and the rest of the runners who were hoping for 4-4:30 marathons that felt cramped. I was dodging people for most of the race and with a narrow course as well as medians in the road, it made for a pretty uncomfortable experience for parts. —Pro – crowd support. 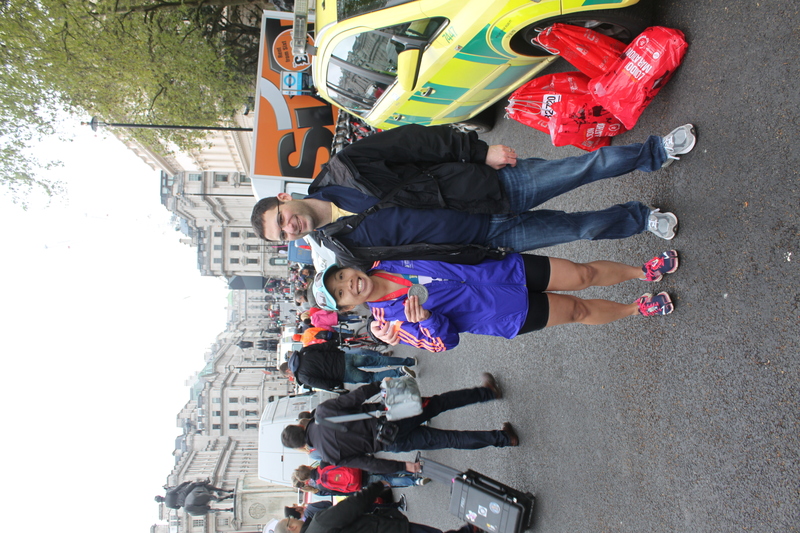 There were so many great fans out and as I mentioned this was the most crowd support I had in any previous marathon. I wish I had enjoyed this part more. —Pro – iconic sites. I loved the start in Greenwich, it was such a cute area and felt like I was in a movie. Running over Tower Bridge was surreal, especially seeing fans from the top of the bridge staring down on you. 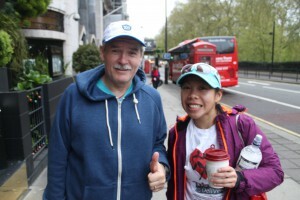 The last 3 miles were along River Thames, passing by the London Eye and eventually seeing Big Ben in the horizon and turning right by Westminster Abbey, down the road to Buckingham Palace and finishing along The Mall. I was in such a crappy place during that time of the run that I didn’t soak in as much of the experience as I should. —Pro – post race logistics. It was extremely easy to funnel out of the finish area. There was a lot of space along The Mall. We were handed our medals fairly quickly and then had to wait a short while to pick up my finisher bag which included my t-shirt and heat sheet. It probably would have been nice to be handed a heat sheet as soon as I finished but everything felt smooth. I was able to pick my bag really quickly and make it out of this area to meet Josh pretty fast. The AgeUK post-race reception was near by so we were able to hobble the stairs to the event for some warmth and food. Flying across the pond to a different country to run a race is a big deal. While it may not have been the best conditions to prep for a big race, I am so glad I did it. I am fortunate for this opportunity to run my first international marathon, finish my third World Major Marathon. I love London so much and I am so grateful for this experience. Thank you to AgeUK for this great opportunity and for all of my family and friends for their support throughout this whole journey. I am bittersweet to take a bit of a break from training but am excited to finally start vacation. 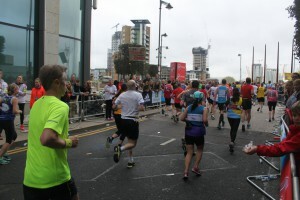 This entry was posted in 2015 London Marathon, Age UK team, London, marathon training. Bookmark the permalink. Reading this broke my heart a little bit. Not because of your finish time and not because of it being tough…but because you think it still wasn’t “your race.” YOUR race is every time you lace up your shoes. You are mentally strong enough to handle marathons because if you weren’t, you would have bailed after the first one. Or you would have bailed after the first “not perfect” race. London went exactly how London went. And you took part of something so cool. And you are taking away so many lessons. If there is anything I have learned after my MANY MANY “failed” races…it is that we are stronger than we could ever imagine. And sometimes you just need your friends to remind you that you are. I am beyond proud of you…and cannot wait to get in a few runs together soon!